Dr. Durham took the time to listen to my concerns, and then went the extra mile to give me peaceof mind. 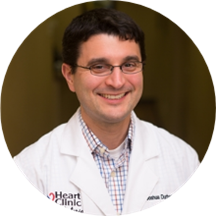 Joshua Durham is a dedicated and diligent cardiologist caring for the San Antonio, TX community. Dr. Durham obtained his medical degree from the University of Virginia. He completed his internship and residency in internal medicine at San Antonio Uniformed Services Health Education Consortium. Further, he completed his fellowship in cardiovascular disease from the same institute. He also holds a bachelor's degree from the University of Virginia. Dr. Durham is a part of Heart Clinic of San Antonio. He is board certified in cardiovascular disease by the American Board of Internal Medicine. He is also certified by the Certification Board of Nuclear Cardiology and the National Board of Echocardiography. During his consultations, Dr. Durham fully explains patients’ conditions and helps them choose an appropriate treatment plan. He conducts his appointments with the personalized care and attention that he would expect for his own family. I am a very nervous person and do not like going to doctors. Dr. Durham made me feel right at home. He thoroughly listen to me (even though at times it felt like I was nervously rambling.) I walked out fromthe visit knowing my concerns were going to be well looked into. And that my heart was in good hands. ?? He was awesome. Very personable and professional. Easy going demeanor, listened to me, has likability and puts patient at ease. Dr. Durham took time with me and answered all my questions. He is thorough and knowledgeable.